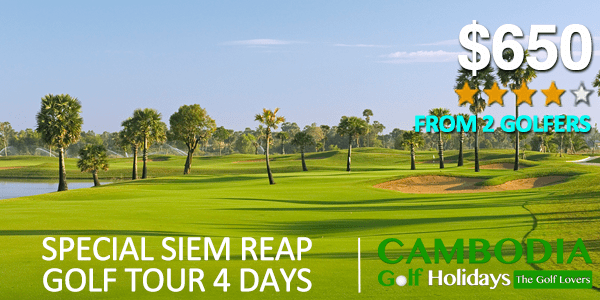 Angkor Golf Resort and Phokeethra Country Golf Club are our choices to design this special golf package for our client with the competitive price. This tour package is including with green fee, caddy and golf cart more over we have included one massage after your tired golfing. Moreover, we have included half day to visit an ancient temple called “Angkor Wat” and after spent about 2 hours in Angkor Wat, you will have a great time to go up the Bakheng Mountain to see a beautiful sunset where most people do not want to miss it. DAY 03: Golf at Phokeethra Country Golf Club. DAY 04: Transfer to Siem Reap International Airport for departure. Arriving the Siem Reap International airport and welcomed by your driver and transfer to hotel for check in and enjoy and relax at the hotel. After lunch, we visit the famous temple called Angkor Wat and evening enjoy the sunset from the top of Bakheng mountain. Morning golf at Angkor Golf Resort (Faldo design – highly recommended tournament course), in the afternoon enjoy one-hour Khmer massage. Golf at Phokeethra Country Club (Sofitel-managed the facility, home of the Asian Tour Johnnie Walker Cambodian Open). Transfer to Siem Reap International Airport for departure.